Meet the new poster boy — worse than the old poster boy! Someone assigned to the 78th Precinct in Park Slope has been slapped with 75 tickets on his personal vehicle — including 53 speeding tickets and five red-light tickets — since March, 2017. So far, this is the single worst driver that Streetsblog has uncovered in its weeklong investigation into recklessly driving cops — surpassing last week’s story about a 23rd Precinct officer caught 41 times for speeding or running red lights. The list of this driver’s crimes is so long that it may break the internet, but here goes (story continues after this stunning graphic). So who is this driver? 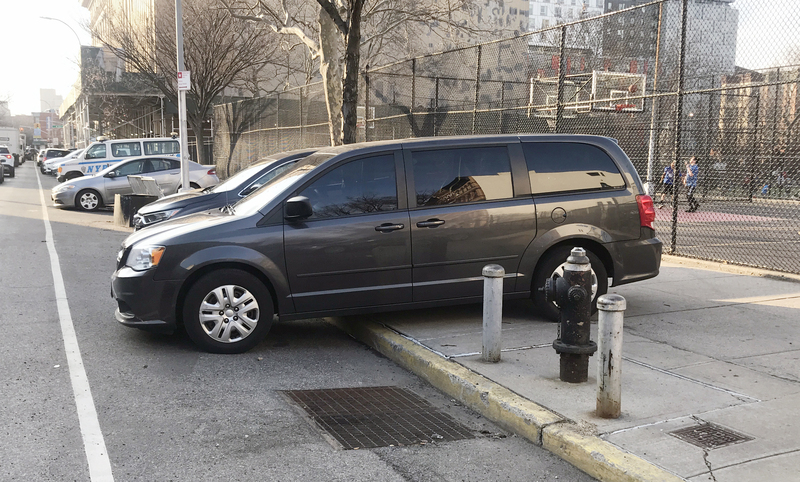 All we know is that this car — a Dodge Caravan — is regularly parked in “NYPD-only” parking outside the Sixth Avenue station house in Park Slope. Every indication suggests that this is a police officer: For one thing, some of the tickets have been dismissed by judges under the coding “Admin Claim Granted,” a suggestion that the officer testified that his reckless driving was in the line of duty (in a Dodge Caravan?). But the driver was ordered to pay 28 of his 53 speeding tickets and three of his five red-light tickets. The Dodge Caravan in question. But only one of the moving violations on this cop’s record was committed within the confines of the 78th Precinct, so if his speeding or running red lights was in the line of duty, his duty takes him far from his command post. Still, even if some of the speeding was related to police work (again, in a Dodge Caravan? ), the list of this 78th Precinct official’s transgressions is so long as to render any claim of professionalism moot. Jan. 15: Speeding ticket in the Bronx. Feb. 12: Speeding ticket at undisclosed location in Brooklyn. Feb. 28: Speeding ticket at undisclosed location in Brooklyn. Council Member Brad Lander has written legislation that would allow authorities to impound vehicle with five or more moving violations in a 12-month period. If that bill was law, this vehicle could have been booted for most of the last two years. Lander told Streetsblog that police officers’ or NYPD employees’ cars would not be exempt under that legislation. 67 police officers’ cars — or 75 percent — had been ticketed for some infraction. 54 of the cars — 60 percent — had been flagged for a serious moving violation, such as a red light ticket or speeding. 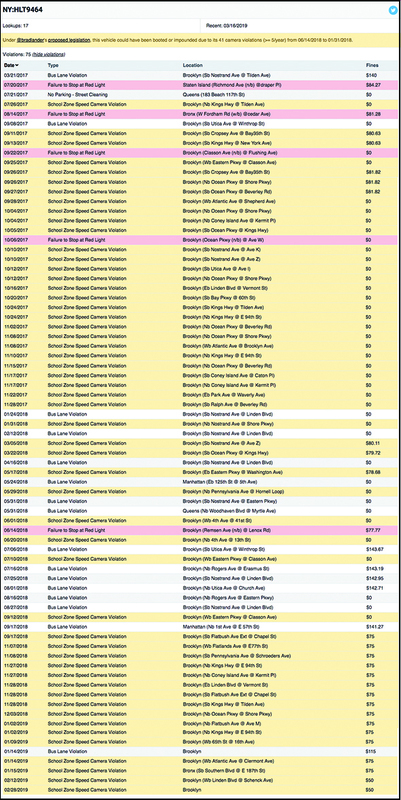 37 cars — or 41.5 percent — had multiple tickets for serious moving violations. 619 of the vehicles — or 77 percent — had at least one ticket. 471 vehicles — or 58 percent — had at least one serious moving violation, such as a red light or a speeding ticket. 300 vehicles — or 37 percent — had repeat serious violations. I’m glad that this is finally coming to light, and I hope that Lander’s bill is enacted. I also hope that once it becomes law, it is applied equally and ALL scofflaws suffer the same consequences. Otherwise it will just be another case of one law for us and another for everyone else (as is the case for placard-holders now). I just don’t get why no city council member will at least call on these drivers to stop parking on sidewalks! Come on, folks. This is a clear violation of the law and makes the right-of-way inaccessible to anyone with mobility issues. The 6th ave facility has far more NYPD employees than that. Did you record all the cars along Pacific St? A sizeable number of staff aren’t patrol, but are desk workers that keep typical business hours. With the precinct adjacent to Atlantic Terminal and the wealth of transit options that pass through there these employees clearly only drive because the city has enticed them to do so. For fun, I’d encourage Streetsblog to do similar reporting during a Barclays Center event when the neighborhood fills with placard abuse from every precinct. Given the regular drunkeness and deplorable behavior of these visiting officers I suspect running their tags would yield some shocking results. So who is it? Throw their name out there and after that get rid of them. They are suppose to abide by the law not abuse it like they all do. No exceptions! Actually, while it serves Park Slope, the 78th Pct. is in Prospect Heights. and of the current 5 comments posted have been written by idiots that do not know anything about police work etc or the reality of common sense. That’s this officer’s PERSONAL vehicle — meaning he doesn’t drive it during the course of their daily work. There’s no work related reason for him/her to be driving like that when not on duty. This person is a menace, and I would surmise they also ignore other motorists who endanger people’s safety, but probably have no issue with writing tickets to cyclists.